We get your water on, guaranteed. With experts in all areas of residential well water systems and service, including expert water well pump repair, electrical testing of control switches & boxes, and pressure tanks, you can count on Earl’s. We have the expert knowledge, experience, and training to accurately diagnose and remedy any issue your submersible pump or jet pump may have. Earl’s Plumbing is proud to provide fast and accurate repairs and timely replacement if need be of your submersible well pump to get your water flowing again. Your submersible pump sits at the bottom of your water well, and is the heart of your well. Its sole purpose is to efficiently push water from the bottom of your well to the top for use in your residence and when an issue arises, you can be stuck without water. Although not as efficient as a submersible pump, your well jet pump sits atop your well, and pulls water from your well, and are generally utilized in shallow wells. 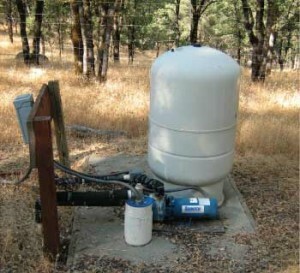 Your water well pump, like your Water Heater, is not meant to be run all the time. This is where your well pressure tank, bladder tank, or storage tank comes into play. Your pressure tank allows for a steady supply of water at a steady pressure, with your well pump only running to refill that pressure, bladder or storage tank when the level drops. We can accurately diagnose any issues you may have with your home’s water pressure tank or storage tank. Your home’s water well is controlled by a system of switches, and testing of those control switches should be performed by an expert. From a control box, to pressure switches, Earl’s Plumbing can get to the bottom of all your well’s electrical issue to get that water flowing again. Low water pressure? Let Earl’s Plumbing come out and perform a thorough inspection to locate the source of your low water pressure. If need be, we can install a booster pump inline to boost your water pressure. The state of your well is critical to ensure constant, quality water for your home or business. Earl’s Plumbing is proud to offer complete residential well inspection service. Whether you are considering buying a home with a well, transferring a home title, need an escrow water well inspection, or keeping up on well maintenance, with our detailed well inspection, you will know the exact condition of your well and water. Tankless Water Heaters – Conserve Water!